FM 108-MKII power amplifier of Resolution Series quality. - FM ACOUSTICS LTD. This performance and engineering marvel amazes in every respect. It optimally represents FM ACOUSTICS' philosophy of avoiding any unnecessary bulk and weight and instead concentrate all efforts on superior performance. While its size is diminutive indeed, its performance is the opposite; this gem of an inherently musical amplifier is quite the contrary of the typical bulky and brash-sounding „overstatement“ power amps. ...and the proprietary safeguarding systems of the larger Resolution Series are employed. The same „zero compromise“ philosophy is evident and use of many identical components guarantees absolute excellence. 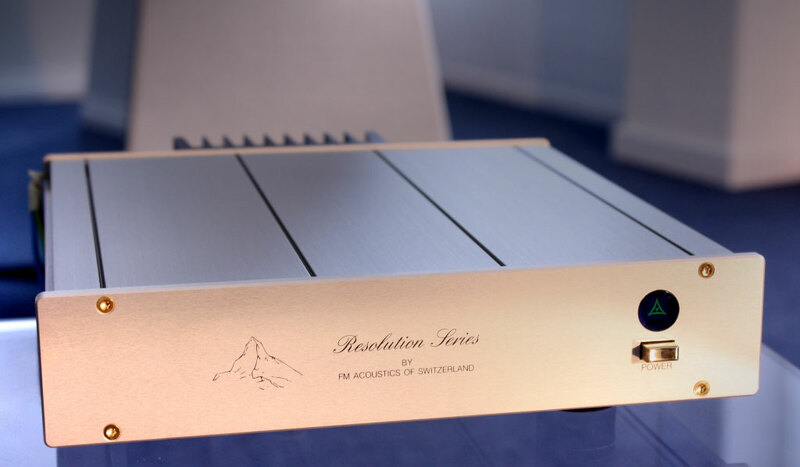 It is hand-crafted in Switzerland by the same craftsmen and craftswomen who create the renown large FM ACOUSTICS amplifiers that are used as reference by leading artists and studios the world over. instead of a switched power supply - which would be small and very cheap but with the huge disadvantage of inherent current limiting - the FM 108-MKII employs a unique high-power linear ‘analogue’ supply. It is therefore completely self-contained and free from the audible disadvantages of digital power supplies. Its balanced symmetrical input recognizes what type of circuitry the preceding pre-amplifier is using and automatically optimizes and balances the audio signal right at the input. The FM 108-MKII is the preferred choice when ultimate audio signal fidelity, dynamic accuracy and neutrality, in short, when Resolution Series performance is required. The FM 108-MKII can be placed next to a speaker or in any remote location. Even when power is switched on remotely it keeps all features such as delayed turn-on, all safeguarding intelligence etc. No long warm up time is required: within ten seconds from switch on it is fully operational and never sounds harsh or bright. The FM 108-MKII is the power base for a discrete high performance music or AV system that will enthrall the most discerning listener. It outperforms other units costing up to six times the price (and which will "provide" up to fourteen times the bulk and weight...). The FM 108-MKII is a dream come true for thousands who already own an FM 122-MKII, FM 133 and/or FM 155-MKII and for those who desire an unobtrusive, musically accurate single channel power amplifier of Resolution Series quality. Max. Output Voltage: 66 V pp. Unlimited repetitive peak output current. More than 15 A continuous. No output or DC fuses, absolutely no form of current-, voltage- or any other kind of limiting. internally settable to any frequency between 1 kHz and 60 kHz (Low-Pass) and 1 Hz to 1 kHz (High-Pass). Electronically balanced discrete class A circuitry, floating ground, non-inverting or inverting mode. Optimal performance with either balanced or single-ended sources. Single ended sources are automatically balanced right at the input of the FM 108-MKII. No minimum impedance. The amplifier is designed for 1 Ohm to 10’000 Ohm systems. It can drive any speaker impedance (even below 1 Ohm) with dynamic (music) signals without any limiting, compression or other negative effects on the audio signal. Despite this, the amplifier is fully protected against short circuits, open circuits and all other adverse conditions via a unique on board computer that continuously surveys all important parameters.